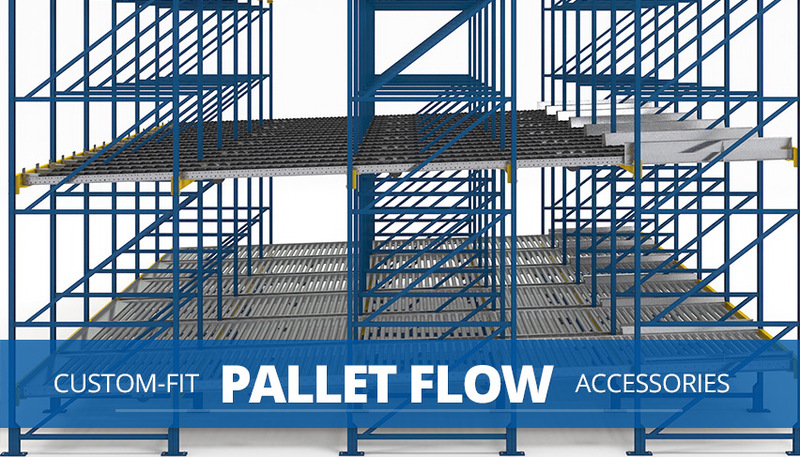 Pallet flow entry guides provide visual assistance for forklift operators to ensure pallets are loaded squared (centered) within the pallet flow lane. Entry guides are custom designed to fit your pallet flow lane specifications and are mounted on both the left and right sides of the charge end of the lane. They can be either top-mounted on the pallet flow lane itself or rack-mounted depending on the application. Deep-lane and floor-mounted pallet flow alike benefit from entry guides. The presence of entry guides at the charge end of the system enables quicker and more accurate pallet loading by providing better lane visibility and guided pallet alignment, increasing productivity and reducing risk for product and equipment damage. Abruptly dropping the pallet into the flow lane will cause damage to pallet flow rails and potentially the inventory and or workers and equipment. Check out our forklift training video for proper pallet loading techniques. Position the forklift squarely at the opening on the charge side of the system. If entry guides are present, center the pallet within the guides. Line up the forklift with the entry guides or the center middle stringer of pallet with center rail. Enter the lane with the pallet 2- 3” above rollers. Do not launch pallets from the forklift using forks. Tilt forks forward to place pallet onto lane, allowing pallet to roll away from fork truck to ensure it does not get hung up on entry guides. Avoid hitting the tips of the forks to the wheels. Back out clearing the pallet flow lane end stop before turning. Position and load the subsequent pallets using the same process. Note: If you notice a pallet with missing or broken bottom board DO NOT place it in the system. If you have any additional questions regarding proper pallet flow maintenance, loading techniques or entry guides, contact our gravity flow experts.